On Tuesday, President Donald Trump repeated without giving evidence claims that Middle Easterners could be in the group. With thousands of migrants making their way north through Mexico, authorities there face a "conundrum" on how to address the so-called caravan with increased pressure from the U.S. to ramp up its immigration enforcement, experts said. Experts on the region said evidence shows Mexico was taking a tough stance on the caravan of roughly 7,000 migrants that began in Honduras in some aspects, but authorities were also more welcoming than one would expect for a country that in the last several years has deported more Central Americans than the United States. "The conundrum that Mexico finds itself is on the one hand trying to be diplomatic and ensure the human rights of migrants, as they ask the United States to do, and on the other hand facing threats from the U.S. and hoping to have a good relationship with the new administration," said Ariel Ruiz Soto, an associate policy analyst at the Migration Policy Institute. "Do you then increase enforcement even though it's already pretty significant and then how do you maintain a positive public appearance in how you handle migration?" he asked, adding, "Mexico is coming to terms with being a transit country." The U.S. Department of Homeland Security is also tracking a new caravan taking shape — this time from El Salvador, according to two U.S. officials, as well as a local source on the ground in Central America and an internal U.S. government report obtained by NBC News. On Tuesday, President Donald Trump called for a change in immigration law and said "we cannot allow our country to be violated like this" in reference to the caravan and repeated without giving evidence claims that Middle Easterners could be in the group. Trump tweeted Monday that, "Sadly, it looks like Mexico's Police and Military are unable to stop the Caravan" and that he had told U.S. Border Patrol and the military that the situation was a national emergency. He said in a previous post that the U.S. will turn away those who do not try to seek asylum in Mexico instead, but the migrants have no obligation to apply in Mexico. In 2014, Mexico began its Frontera Sur, or Southern Border, policy cracking down on unauthorized immigration via Central America after the Obama administration declared a crisis over the number of migrant children arriving at the border. While the Mexican government had been prioritizing "enforcement as opposed to the protection and asylum" for around the last decade," the 2014 border plan ramped up immigration enforcement efforts, said Daniella Burgi-Palomino, a senior associate at the Latin America Working Group. "What we saw in 2014 the Mexican government stepped that up with U.S. support, pressure and funding," she said. Data provided by the Migration Policy Institute showed that that Mexico has removed more people from the Northern Triangle (Guatemala, Honduras and El Salvador) from its country than the United States every year since 2015. After removing roughly 77,000 migrants from Mexico in 2013, the nation has removed 91,000 people in 2014, roughly 165,500 in 2015, another 149,000 in 2016 and more than 94,500 in 2017. By contrast, the United States removed roughly 104,500 people in 2013, compared to about 121,800 in 2014, roughly 75,350 in 2015, roughly 76,470 in 2016 and roughly 74,800 in 2017. Data from January to August of 2018 showed Mexico has deported more than 86,400 people. Those numbers do not include voluntary returns by migrants themselves with the help of immigration authorities in both countries. 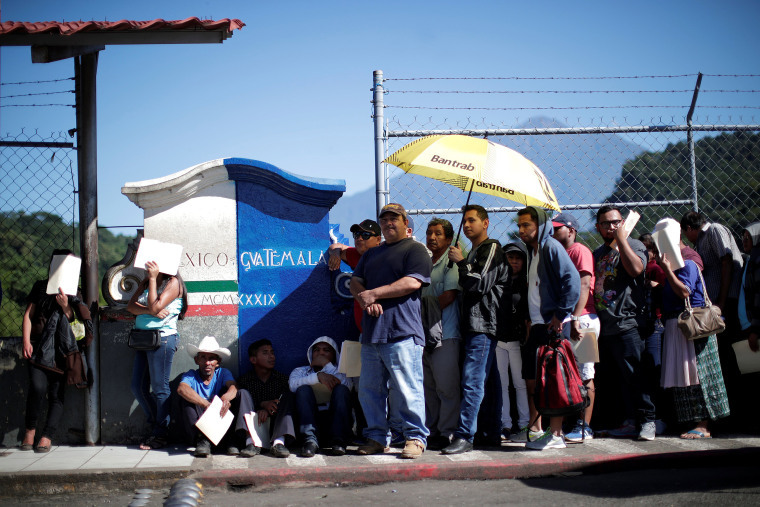 Thousands more have applied for asylum in Mexico, but the government's asylum organization has suffered from under funding and under staffing, said Burgi-Palomino. Mexican President Enrique Peña Nieto's government has sought assistance from the United Nations High Commissioner for Refugees to provide on the ground assistance for migrants seeking to claim asylum, a move that was seen as largely positive, according to Ruiz and Burgi-Palomino. Mexico's Secretary of the Interior has indicated that the Mexican government will not use violence to stop the caravan and is not seeking to deport all of the migrants, but rather seeking an organized migratory flow. The government of Mexico has received over 1,000 asylum claims from the migrant caravan already. Mexico's President-elect Andrés Manuel López Obrador, who takes office in December, said last week that his administration will give employment and visas to those who leave their Central American countries. And incoming Mexican Secretary of the Interior Olga Sanchez Cordero said the migrants will be employed in the construction of the Maya Train, the rehabilitation of Isthmus of Tehuantepec, and the planting of one million hectares of fruit trees and timber. But Burgi-Palomino said the current administration's move to send a convoy of federal police in riot gear and helicopters to the river border between Mexico and Guatemala "stepped up outside of migration enforcement entities that we're seeing at the border" and sent a message based on enforcement. And an internal report from the U.S. government shows Mexico's National Institute of Migration has plans to barricade the Hidalgo point of entry to the United States and patrol the Suchiate River to prevent further crossings. Thus far, Guatemala repatriated about 1,500 migrants with the caravan and Mexico has sent back 955.